Maryland Crab Meat is an American favorite as the main ingredient in some of the best tasting crab recipes. Having a light, sweet taste, and hearty texture makes the blue crab meat a real delight. 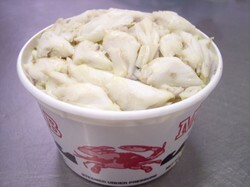 Our Backfin Lump Crab meat contains large broken pieces of lump and body meat. Making it great for crab cakes, crab imperial, stuffing fish, crab salad, crab dips, crab balls and other great crab recipes! All the crabs we pick fresh daily are caught daily by local waterman throughout the Chesapeake Bay. Once they reach our docks they are steamed to perfection, then hand picked while still hot. The meat is canned and available to you that same day. You can't get it any fresher! During the winter months, our crab meat is nitrogen frozen. Place into the refrigerator to thaw overnight. All orders are placed in styrofoam coolers with sub-zero frozen gell packs to assure premium freshness. Then shipped that same day via optional Overnight or 2-day shipping. The crab meat we sell is hand picked daily in our picking house from frest crabs steamed right off the boat. Canned fresh and shipped directly to you. The crab meat is packaged in a sryrofome cooler with gel packs frozen at sub-zero temperatures. This means you can eat and prepare your favorite crab dishes right out of the box. Be sure to refrigerate or prepare your crab meat to eat upon receiving your order. This where recipes will be located! One pound of frest hand picked premium crab meat. The shelf life of crab meat is 4-6 days under constant refrigeration.